1. Which Layer 4 protocol does EIGRP use to provide reliability for the transmission of routing information? 2. Which of the following statements describes the bounded updates used by EIGRP? 3. What is the EIGRP term for a backup route? A suboptimal route may be chosen as the best path to a destination if the bandwidth setting is higher than the actual bandwidth of the link. 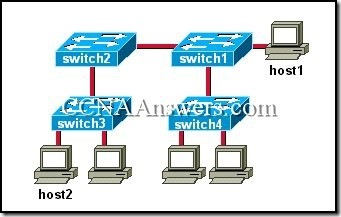 The network may be unable to converge if the bandwidth setting does not match the actual bandwidth of the link. Routing updates might arrive too fast for the interface to handle and be discarded because of buffer overflow. The configured bandwidth must match the actual speed of the link so the link will operate properly. Setting the bandwidth to a higher rate will optimize the effective throughput of the link. 5. 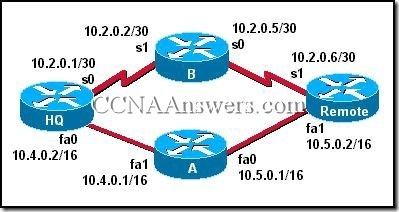 If an EIGRP route goes down and a feasible successor is not found in the topology table, how does DUAL flag the route that has failed? 9. Which of the following router commands is recommended only for troubleshooting specific types of network problems, not for monitoring normal network operation? 10. Which EIGRP command is used to view all routes that are known by the router? 11. What is the default administrative distance of EIGRP internal routes? Neighbor routers can quickly take over for a router that is in passive mode. New routers and their routes can quickly be discovered by neighbor routers. A router can share routing loads with neighbor routers. A router can quickly discover when a neighbor router is no longer available. Changes in network topology can quickly be shared with neighbor routers. Neighbor routers can save overhead by sharing their DUAL databases. 14. Which command will help identify established OSPF neighbor adjacencies? 15. Which command will display only the current EIGRP routing table entries?